Have you heard of Uprinting.com yet? They are a wonderful printing company that does label printing and has everything from business cards to posters to window clings and custom stickers. The stickers can be used for multiple things. They are great to put on packages or envelopes to add your personal touch and as a great way to promote your blog or your business. You can also use them as address labels, event stickers, personalized price stickers, campaign giveaways, etc. 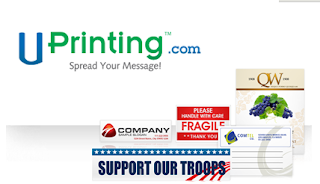 @Latsyrc728 has a UPrinting.com 4 day #Giveaway- 250 Custom Stickers http://goo.gl/fb/kmyb (ends 2/28) #contest @Uprinting Please RT!! Giveaway ends 2/28/10 at 8AM EST. Giveaway is for US residents only. Winner will be chosen randomly. Winner will be contacted via e-mail and then will have 48 hours to respond before a new winner will be chosen. I would love to get some of their business cards as well!!! Thank-you for the Friday Follow. It looks like we have the one of the same giveaways going on, only mine ends end of next week. I will come back again and see what you have going on. I love giveaways. I'd like to try the greeting cards since you get to chose everything. Thanks!